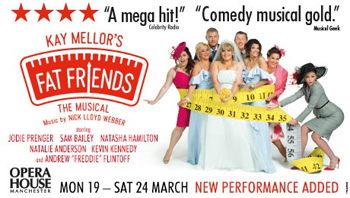 This is writer / director Kay Mellor's foray into Musical Theatre after her hit comedy TV series of the same name. The show opens with lycra and spandex clad overweight bodies bumping and gyrating at a Zumba class at the local church. The year is the present, not a flashback to the 80s, and so this is an instant fail, and sadly the show never recovers. The show relies on superficial, tired, worn-out, hackneyed cliche to drive both the narrative and the humour, and the cardboard cut-out characters that people this unknown corner of Headingley, Yorkshire, with the humour being very base, vulgar and obvious. The curtains open onto a set of pantomime flats which even Friedensreich Hundertwasser would have baulked at, with bedroom windows which open for people to sing and talk through in the style of Avenue Q.
Kevin Kennedy plays the owner of a failing fish & chip shop, Fergus, whilst his wife, Betty, played by Sam Bailey, religiously attends the local Slimming Club. She is about to be honoured with 'Slimmer Of The Year' when she realises that she is gaining weight, and then the penny drops, she may be 43, but, she is pregnant! Add to this the fact that their grossly overweight daughter, Kelly (Jodie Prenger) is engaged to be married to her sweetheart, the dim-witted, though well-meaning but currently unemployed Kevin (Andrew 'Freddie' Flintoff). She has decided on a wedding dress that she cannot fit into nor can she afford. Enter svelte and shrewd businesswoman Julia (Natasha Hamilton), the owner of this chain of Slimming Clubs, and she persuades Kelly to slim to the required weight so that she can use her as publicity for her business. In return, she will pay for the wedding. However, to help her along, Julia offers Kelly a 'helping hand' of some dangerous slimming tablets, which Kelly naively takes. The subplot concerns the vicar of the church, Paul (Jonathan Halliwell) falling in love with Lauren (Natalie Anderson) who runs the Slimming Club, who just happens to be Jewish, and at 34 is still a virgin. Put a friendly local chubby ambulance driver and a lesbian kiss into the mix, and that is more or less, the storyline. Of course there are certain problems along the way, the everyday sort of issues that families face on a daily basis, such as allowing your son-in-law to work alone in a chip shop without any training and then finding he blows the place up. But all the events are taken with a very superficial blow to the chin and life in this Yorkshire town carries on regardless. With instantly forgettable music by Sir Andrew Lloyd Webber's son, Nick, and a mind-numbingly banal and quite long show, it may appeal to those people who enjoyed the TV series or find genuine pleasure in that particular style of comedy but didn't to me.